Lighting A Revolution: Ink Blotter 3904, "If You Can Get Better Light...."
"If You Can Get Better Light...."
Blotter number 3904; image number: LAR_B3904. "If you can get better light and save more than half the current isn't it worth while to buy the new lamp and make a big saving on your bills?" "The G.E. 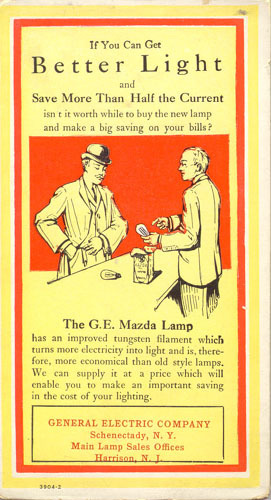 Mazda Lamp has an improved tungsten filament which turns more electricity into light and is, therefore, more economical than old style lamps. We can supply it at a price which will enable you to make an important saving in the cost of your lighting." Lamps featuring substantial technology improvements typically cost more when first offered for sale. High-priced general purpose lamps pose a challenge for salespeople: how to convince buyers to spend the extra money when the improvement may not be obvious. Sellers of compact fluorescent lamps (CFLs) today face this problem with consumers accustomed to inexpensive incandescent lamps. This same problem existed nearly a century ago as tungsten-filament lamps were introduced to consumers used to buying less-expensive carbon-filament lamps. Then, as now, salespeople tried to make their customers think in terms of long-term or "life-cycle" costs rather than the initial, upfront costs. 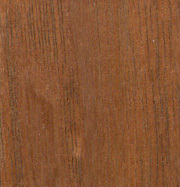 This is the approach seen in the blotter above. The salesman is literally pointing out the features of the new lamp to his customer, while the caption explains (quite truthfully) that these lamps are more economical than the old. The economy stemmed for the higher energy efficiency of tungsten over carbon filaments. "Better light" in this context meant brighter light. Economic History 10, no. 1 (Fall 1972), p.3. National Museum of American History, Archives Center collection #2002.3019, General Electric Nela Park Collection; collection # 60, Warshaw Collection of Business Americana.